A delegation from the British Parliament, representing the All-Party Parliamentary Group on Western Sahara (APPG), has begun as from yesterday, Thursday, a visit to occupied territories of Western Sahara, with the purpose to witness in situ the gross violations committed by Moroccan colonial authorities against Saharawi people, said a statement issued today by Polisario Front’s office in the UK. According to the statement, the delegation is led by Mr Jeremy Corbyn, MP for Labour Party and president of APPG on Western Sahara. He is accompanied by Mr Mark Williams, Liberal-Democrat MP and APPG’s Secretary, and composed of Mr John Hillary, President of the British NGO War on Want , and John Gurr, coordinator and provides non-profitable services to the Intergroup from outside the Parliament. The delegation intends to hold various meetings with representatives of Saharawi civil society, among them human right activists, leaders and representatives of the main associations that advocate for human rights inside the occupied territories of Western Sahara. The delegation also proceeds to see on the ground the reality of all what is happening in the occupied Saharawi territories, of which the flagrant human rights violations and plundering of the Saharawi natural resources, being carried out amid a state of military and media siege imposed by Moroccan occupier over the Territory. After finishing their visit, the British parliamentarian delegation plans to present a report on the visit to the British Parliament in a conference to be held on Western Sahara and Human Rights, next February 25th. Speakers include the MPs Mark Williams and John Hillary will refer to the report they will elaborate regarding their visit to the occupied territories. Mr. Brahim Dahan, one of the Saharawi intifada’s (uprising) icons and prominent human rights activist, also President of the Saharawi Association of Victims of Grave Human Rights Violations committed by Moroccan State, will also be one of the speakers. 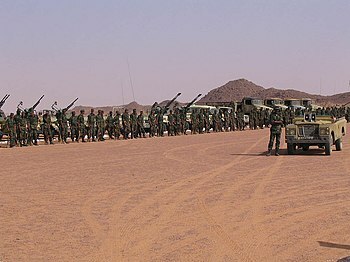 Gathering of Saharawi troops, near Tifariti (Western Sahara), celebrating the 32nd anniversary ot the Polisario Front. This visit, to be concluded on February 17th, is the first of its kind in the history of British Parliament, a thing which, said the statement, reflect the growing interest the Saharawi cause is enjoying within the UK, especially as the country campaigns for the extension of MINURSO’s mandate to include the monitoring of human rights in occupied Western Sahara. Posted on 14th February 2014 by newsafrica. This entry was posted in Africa, Dictatorship, Human Rights Violations, Morocco, Western Sahara and tagged All-Party Parliamentary Group, El Aaiún, Human rights, Jeremy Corbyn, Morocco, Saharawi, Sahrawi people, Western Sahara. Bookmark the permalink.